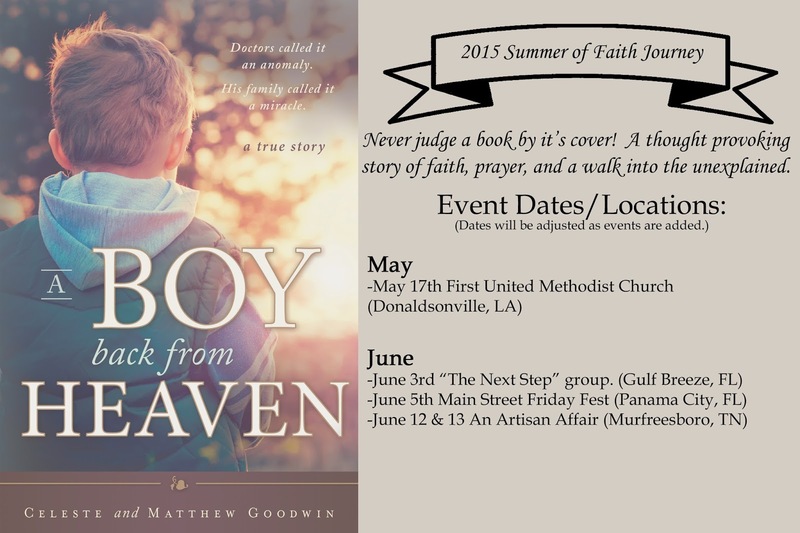 We are excited to announce the 2015 Summer of Faith Journey! We have scheduled a few specially chosen dates for signing and speaking events. If you are interested in having us visit your group or event, please send an email of inquiry to info@celestegoodwin.com. Please provide as much event information as you have and appropriate contact information. We will review the requests and get back to you as quickly as possible. We receive quite a large number of questions from readers asking about the personal impact of sharing such a private story. In the time since the release of the book, our choice to share with the world has been reaffirmed numerous times over. This affirmation has come in the form of personal stories from others and hearing how people have been deepened in their faith. I don't believe there are any accidents. God has control of the situation. He can choose to speak to or reveal to anyone what He chooses. This is done without Him having to ask permission to do so, or justify it to anyone. He is the ALMIGHTY! We are grateful for the reviewers and bloggers that spend their precious time reading our story and sharing their thoughts. I hope you will take some time to read through the 5 star review that was recently given on our Blog Tour. It warms my heart when I know the intended meaning we hoped to convey to readers is felt and understood. Matthew's account simple. Nothing more and nothing less. We told it as it happened to our family and spent much time in the book conveying how our faith was strengthened. No doubt about it, we have grown closer to God is ways I am so grateful for. I have truly learned that no matter what path God sends us on, we will NEVER be alone. He will always be there, and if necessary, will carry us when we can no longer walk.